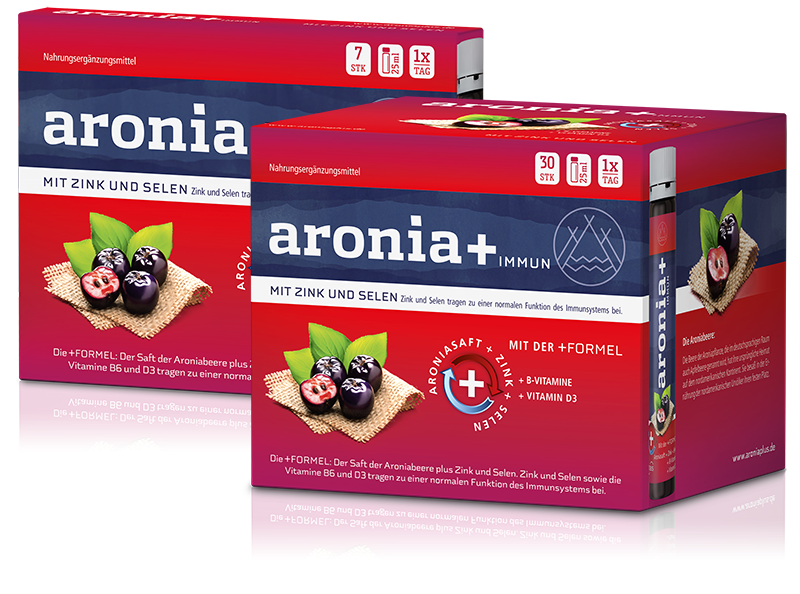 aronia+ is a food supplement based on the juice of aronia berries combined with the immune minerals zinc and selenium as well as B‐vitamins and vitamin D3. Zinc, selenium and vitamin B6 contribute to the normal function of the immune system. Zinc, selenium and vitamin B2 (riboflavin) help to protect cells from oxidative stress. Always on the road? Not a problem! Simply enjoy aronia+ wherever you are – the practical ampoule for oral intake makes this possible! Available in the weekly‐ (7 ampoules) or monthly pack (30 ampoules). It is recommended that aronia+ is used over several weeks. The recommended daily allowance must not be exceeded. Food supplements are not a substitute for a well-balanced, varied diet and a healthy lifestyle. Take 25 ml daily (equivalent to one ampoule for oral intake) after a meal. If you have a sensitive stomach, you can dilute aronia+ with still water. Diluting it softens the pleasantly tangy fruity flavour. Please shake well before consumption.. Ingredients: Aronia juice (from concentrate) (87.3%), sugar, aronia juice concentrate (2.7%), acidifying agent (citric acid), preservatives (potassium sorbate, sodium benzoate), zinc gluconate, natural aroma, niacin, pantothenic acid, vitamin B6, vitamin B2, vitamin B1 sodium selenate, vitamin D.